No, nobody asked for this. But it’s been a while since I’ve done a good old breakdown of a twelver. 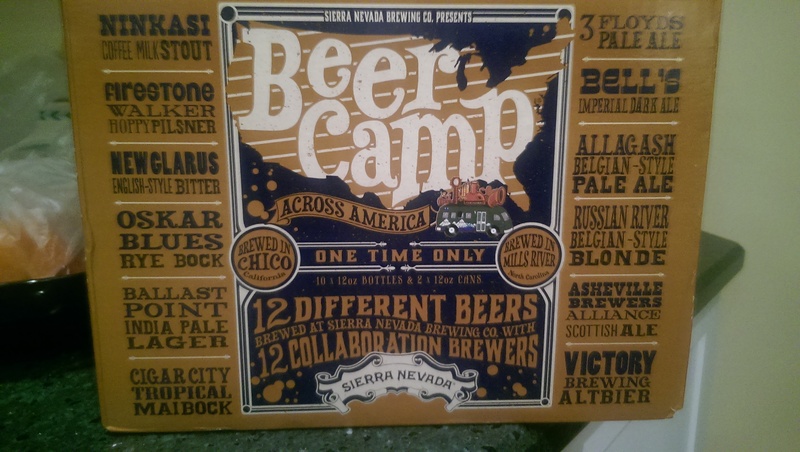 And where better to begin than with Sierra Nevada’s Beer Camp 2014? 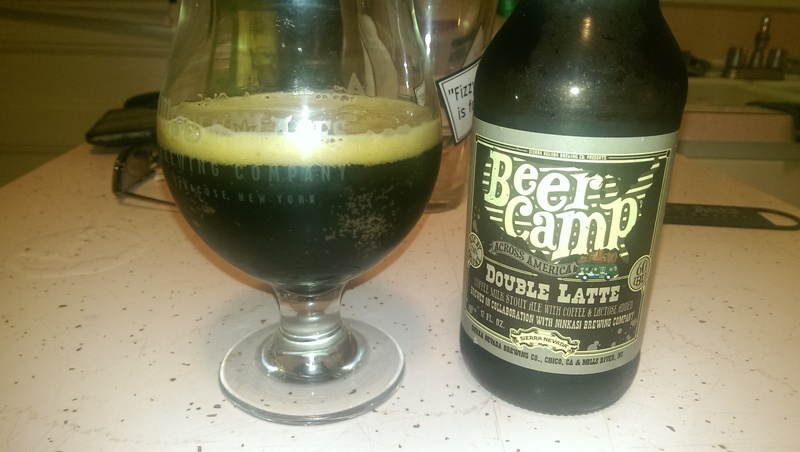 If you spent any time on beer-related social media in late July 2014, you probably read something about the 2014 Beer Camp pack, which they are calling “Beer Camp Across America.” The 2014 version differs from their Beer Camps of the past — where four beers were selected and sold in a mixed twelve-pack. Those packs were always worth a look, but this year SN is doing something wildly different. Anyway, due to the scarcity of the Beer Camp Across America, people were posting videos of themselves on Vine and Facebook hoarding five, sometimes ten boxes of the stuff. (What are they going to do? Age them?) I just wanted one, so I could sample each one and post it up here for posterity. Someday, decades from now, someone will wonder about the legendary Beer Camp twelve-pack of ’14 and wonder, was it worth all the hubbub? They’ll need look no further than right here. I’ll show you all twelve beers, my tasting notes, and my rating for each. Click on any image to get a (VERY) large and close-up view of it. Take my hand and let’s begin…. 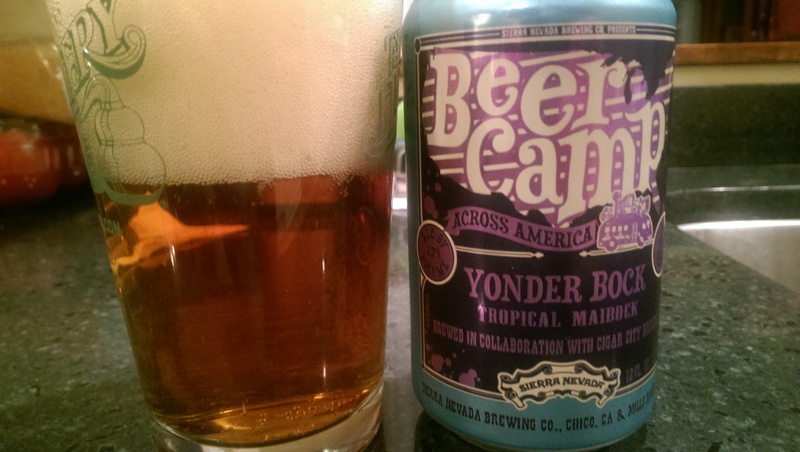 Yonder Bock, a canned collaboration between Sierra Nevada and Cigar City. My first selection was Yonder Bock, a “Tropical Maibock” collaboration with Cigar City of Tampa, Fla. Cleverly, Sierra put two of the twelve pack into cans, deferring to their canned-beer collaborators. Cigar City isn’t available everywhere in Upstate New York, so this was one of the more intriguing beers in the pack. Three Floyds is another brewery we almost never get in Upstate New York. 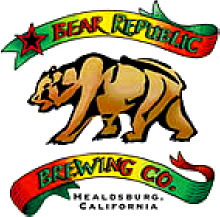 (The dearly departed Clark’s Ale House sometimes carried Alpha King and Gumballhead, but that was before the Yakima Hop Crisis.) So I made sure I got to this one before my greedy family got home and tried to take it from me. Chico King pours a clear carrot orange color; it has a massive, long-lasting head. (Don’t let the photo above fool you, most of these were half-pours, decanted with authority.) 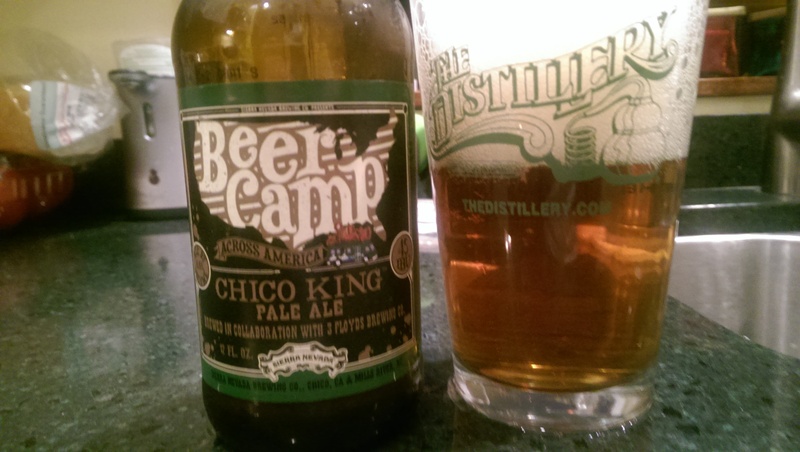 The hop flavor is woody, oily stuff, with an earthy, almost English malt balance. I was expecting a hop-bomb here, but it’s actually beautifully balanced. And the label says it’s 6.5%, but from the taste I would have guessed nearly double that. 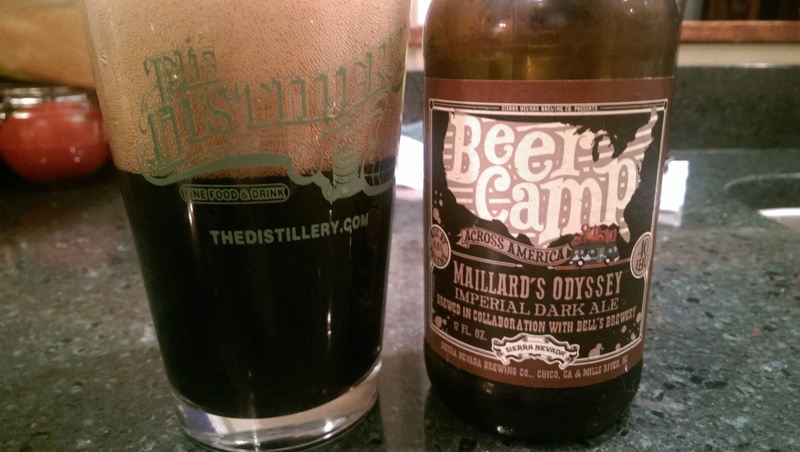 Maillard’s Odyssey, a collaboration between Sierra Nevada and Bells Brewing. It pours a deep, dark chocolate brown — almost black. It settles with two fingers of cardboard brown head. The scent is a panoply of nutty aromas: cocoa, malted milk balls and hazelnut. The flavor is what you get on the bottom of your mom’s burnt chocolate chip cookies. (Or at least my mom’s.) There is a dry, ashy feel that would help this replace your coffee to pair with your favorite chocolate dessert. 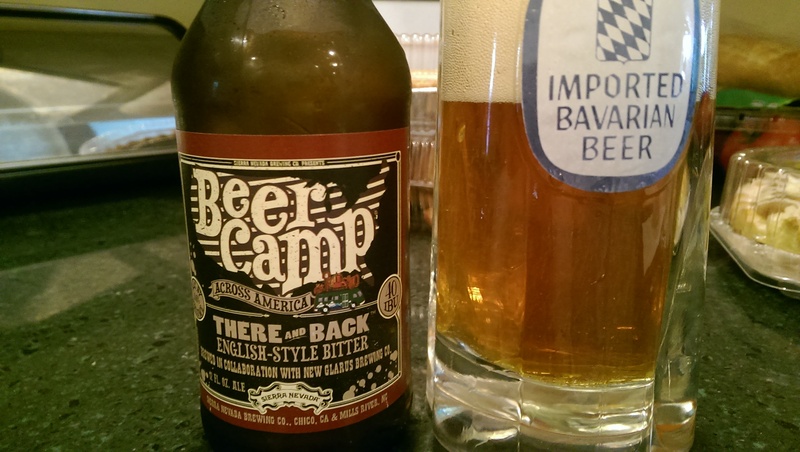 There and Back, a collaboration between Sierra Nevada and New Glarus. Since New Glarus is yet another brewery we cannot get anywhere close to where I live, so thus far this 12 pack has been a nice little tour of uncharted territory for me. This English-style pub ale is dark orange, with a pockmarked white head. Almost resembles an American amber. The carbonation in this one is nearly off the charts. 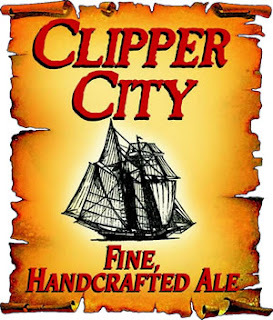 The flavor and aroma are mild toffee sweetness, with an accent of bittering Euro hops. Is it the most complex beer of the bunch? Not by a long shot, but it’s supremely drinkable, and is probably the best change-of-pace beer in the box. A better mid-afternoon beer you are not likely to find. 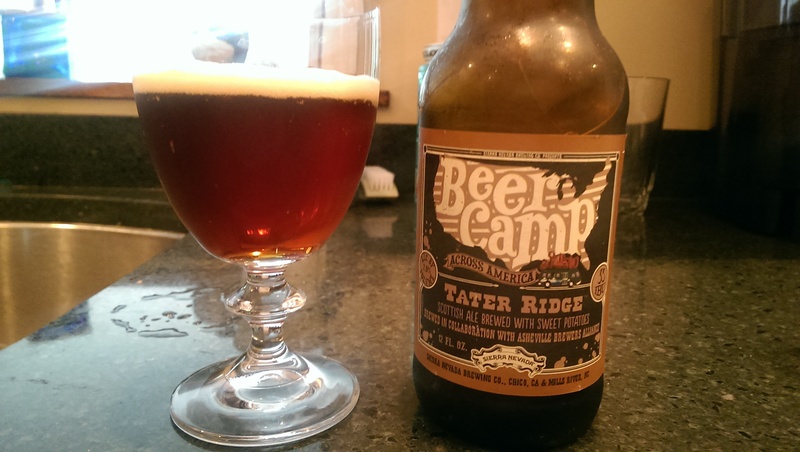 Tater Ridge, a collaboration between Sierra Nevada and the Asheville (N.C.) Brewer’s Alliance. While Asheville, North Carolina, may not be the new Portland, Ore,, or even the new Chico, Calif., it is a burgeoning beer hub in which Ken Grossman decided to build Sierra’s second brewery. The Asheville Brewer’s Alliance is a collection of Asheville area breweries who have formed a coalition to promote the area’s exploding craft beer scene. Now I can’t say that I’ve ever had a beer brewed with sweet potatoes before, and since I’m not a fan of yams, I wasn’t super excited for this one. But it should have been no surprise to me that I would be pleasantly surprised. It pours a deep, cloudy brown, not unlike watery coffee. (Not pejorative, just a description.) The first half of the beer is best described as “succulent”: it’s got a heavy brown sugar aroma, along with what must be the sweet potato-y spice. I have to admit that I wouldn’t have picked up on that had it not been on the label. There is an unusual cooked vegetable component to the nose. The sweetness turns to a nuttiness as it warms up, and you must let this one warm up, because the molasses really bursts out about 10 degrees higher. The flavor keeps the sweet tradition alive, with an amplification of the sugars and nutty malts. It’s got an almost pungent quality. Again, as it warms up, the spiciness (cinnamon?) kicks in. It’s also got a wonderful aftertaste. This would go well with any kind of umami-heavy dinner, like roasted duck. 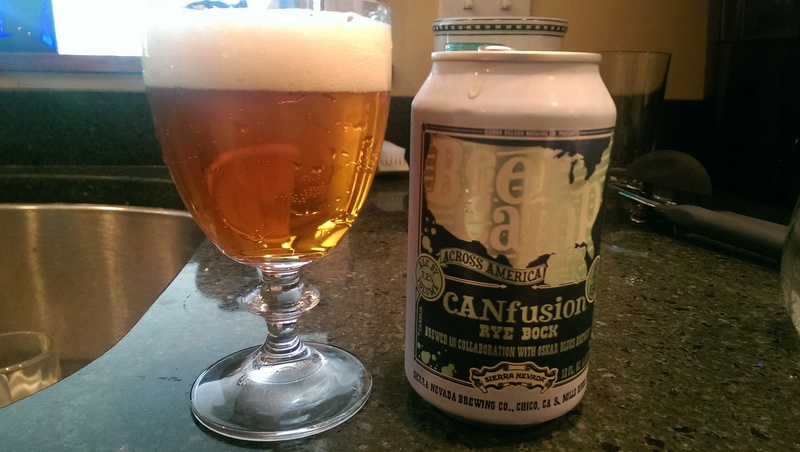 CANfusion, a collaboration between Sierra Nevada and Oskar Blues. The second canned offering of the box, this one from Oskar Blues, arguably the most well-known canned craft brewer in the United States (of America, that is). 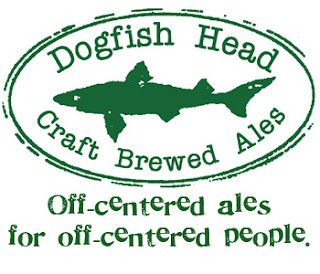 Personally, I find all of their beers to be both very good, and very overpriced. With this one, I was surprised to find a heavy dose of apple skins in the nose. The honey orange color made me think it was actually apple juice. The flavor is cider, but not the “hard cider” that is in vogue right now, but an actual apple cider that you’d get after a hayride. There is a spice that reminds me of cinnamon. And I’m not damning this one with feint praise by saying it would be great to give to a non-beer drinker. 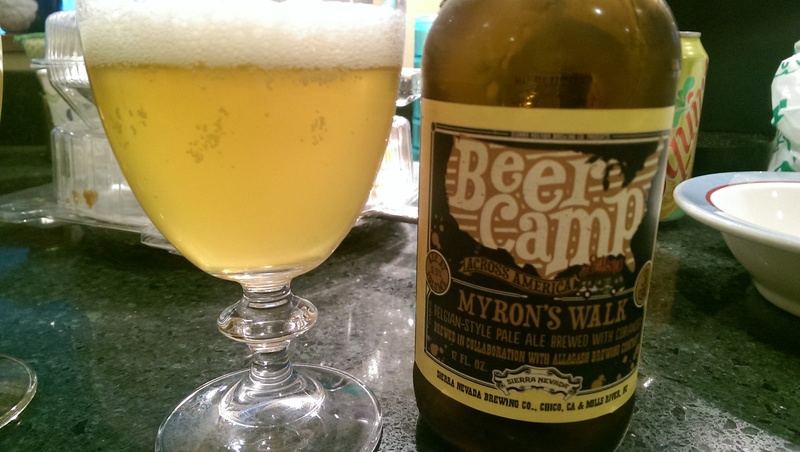 Myron’s Walk, a collaboration between Sierra Nevada and Allagash. 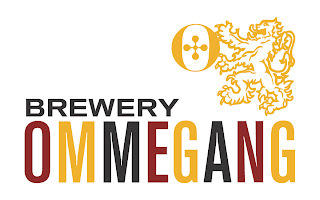 I’m a sucker for Belgian ales, and I have a soft spot in my heart for Allagash Brewing, especially their Dubbel, which I think is sublime. This little golden number has a decent amount of carbonation, but yet doesn’t become overly bubbly. The aroma is beautifully perfumey, with a flowery presence that floats above the glass. The yeast presence is incredibly prevalent, adding both dryness and sourness. The sourness isn’t the gueuze, vinegar kind of sourness that is all the rage right now, but a mild tartness, akin to a lemon or citron complexion. 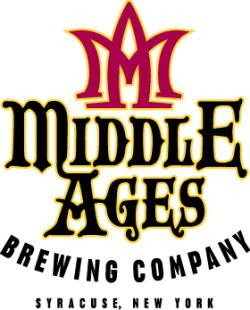 This tartness is balanced by earthy, leafy malts. I’m reminded of a witbier/pale ale hybrid, or a “Belgian Pale Ale,” if such a neologism is valid. 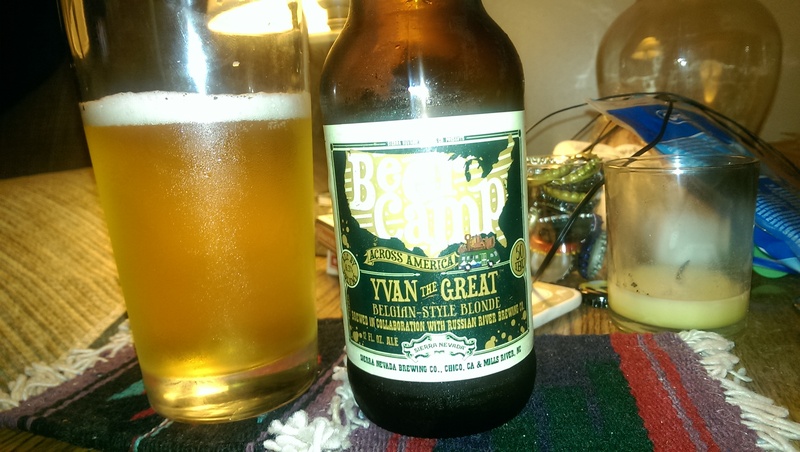 Yvan the Great, a Sierra Nevada Collaboration with Russian River. 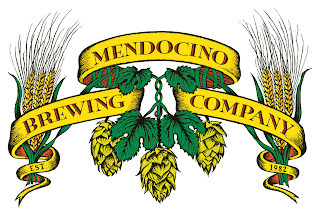 Don’t let the quasi-Communist name fool you, Russian River Brewing Company is one of the finest American brewers out there. And though I’m sure you can find them at every 7/11 on the West Coast, it is pretty hard to come by in Western/Central New York without a go-between. And this one might be the most complex of the bunch. The aroma has a surprising element of tobacco and peat smoke right off the top. As you take second and third and fourth sniffs, you will get sour lemon, mint, key lime, and a yeast presence I can only describe as mango yogurt. Maybe a creamsicle? Also has a horseblanket funk that reminds me of a Saison/farmhouse ale. The first sip is mint leaf, followed by that basement funk; the yeast just doesn’t stop. There is also a creamsicle flavor that is really refreshing. The sweet/funk balance is strong. The buttery slickness makes this one go down way easier than it probably should. 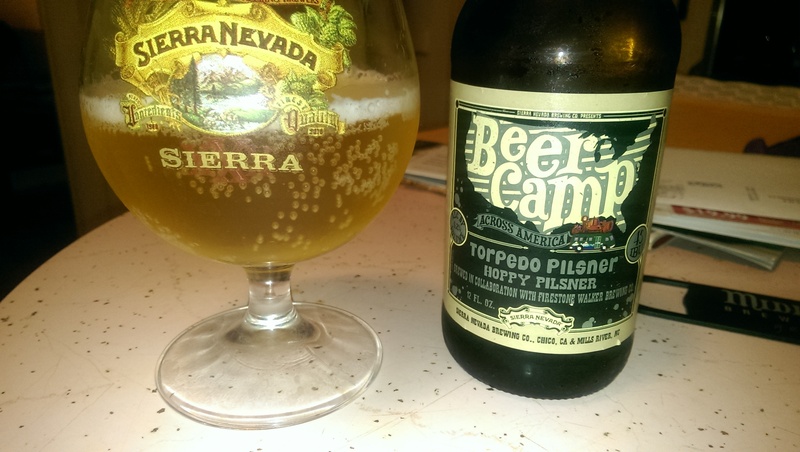 Torpedo Pilsner, a collaboration between Sierra Nevada and Firestone Walker. Paso Robles, California’s Firestone Walker doesn’t just have the best logo in all of American brewing, but they make some outstanding beers. Torpedo Pilsner, while decent, is not one of their best, and so far it’s the weakest of the bunch. Since you can’t usually do too much with a pilsner, I’m not all that surprised. The color is a flat, straw-yellow color, akin to any kind of macro stuff you might see at a townie bar — but I won’t hold that against it. It actually gives the beer a light, refreshing look. 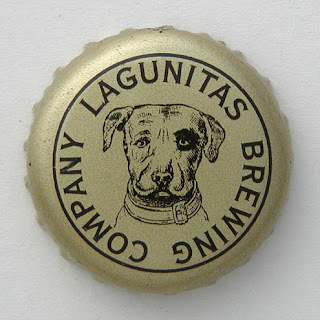 But when you take a whiff, that macro lager aroma kicks in, albeit a good version of that macro style. Seems to have some rice. There is some bittering hops, but although the backbone is clearly all-malt, there is some butterscotch sweetness which, while not “off” per se, is out of place. It’s by far the grainiest pilsner I’ve had in a long time. It’s not a bad beer by any stretch, it’s just not up to the standard of these two great breweries. 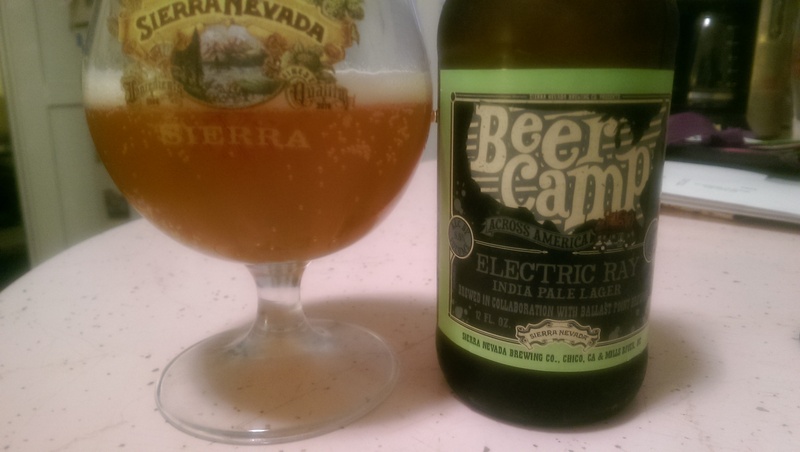 Electric Ray, a collaboration between Sierra Nevada and Ballast Point. Part three of my California triptych, San Diego’s Ballast Point is relatively new to Upstate New York, and while I think Sculpin is the real deal, I’ve been somewhat underwhelmed with the other offerings we get here. 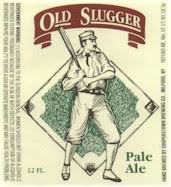 Again, even a mediocre craft beer is still good, so it’s not a slam, but everything is graded on a curve these days. Electric Ray is an India Pale Lager (IPL), an emerging style which I think is kind of pointless: if you want a hoppy beer, go with the complexities and malt-forward backbone of an ale, rather than the crisp, shiny malts of a lager. The balance is crucial. Still, Sierra and Ballast Point know much more than I do. The aroma of this yellow-orange beer is strangely sulfuric; not quite a rotten egg but in that neighborhood. More along the lines of broccoli. There is a curious mix of black licorice and rye malts. The hops are very piney. When it’s cold it just smells a little off; when it warms up the sugars come out and bury the sulfurics. The taste is surprisingly yeast-heavy and bready. The malts are sugary and almost herbal, incredibly close to a barleywine. I do have to say that it’s maybe the most complex lager I can remember having, if not necessarily the best. 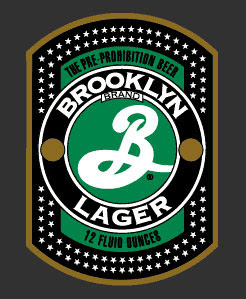 The hops here are strictly an accent, so don’t expect any kind of hop-head’s delight here. It’s just a nice, solid, middle of the road beer. 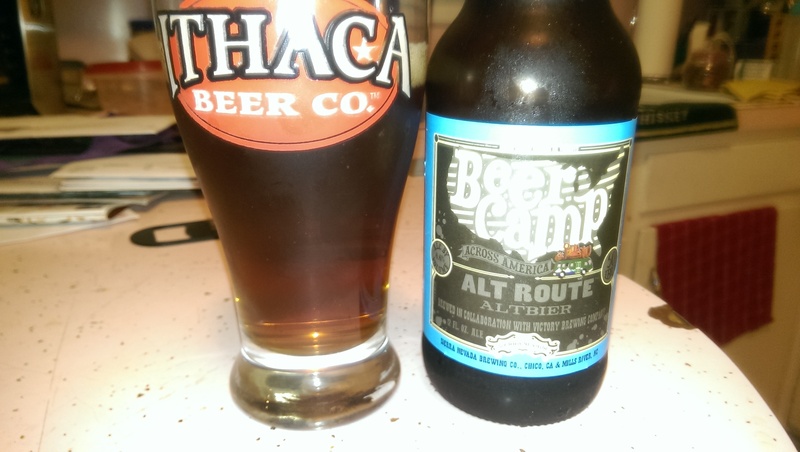 Alt Route, a collaboration between Sierra Nevada and Victory Brewing. Just because Victory is old hat around these parts — Hop Devil predates even my own beer obsession in Upstate N.Y. — it doesn’t mean they aren’t still at the top of their game. And I’m a sucker for a good altbier so I was happy to saddle up here. The beer pours a murky copper-orange complexion. It sweats on the outside of the glass but that might actually be my fault. The aroma is sugary malts, and it’s beautiful. There is a alkaline, metallic component at first, and it is actually not at all off-putting. In fact the AA battery quality enhances it. 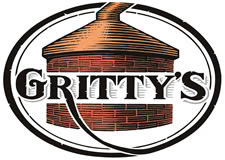 The flavor is mild and grassy hops, followed by complex malts. The malts are sweet sugars and nutty grains, which balance each other very nicely. The aftertaste is a dry nutty quality; it’s almost like mocha or coffee. Very curious but also extraordinarily pleasant. A great, mild, middle-of-the-road beer that I’d be happy to buy a sixer of any day. Double Latte, a collaboration between Sierra Nevada and Ninkasi. Eugene, Oregon’s Ninkasi Brewing collaborated with Sierra for this, my twelfth and final of the Beer Camp Across America series. I was told to save this one for last since it was the most satisfying one. And although not my favorite, it’s a hella nice brew. To be frank, there is nothing here that I haven’t had before, but that doesn’t mean it isn’t terrific in this here context. The color is a deep, dark brown, as expected. The layer of head is a mocha brown. The aroma is sweet chocolate, breakfast blend coffee and dusty mocha. Is it complex? Is it unique? No. But is it incredibly pleasant and aromatic? Heck yes. The flavor? Second first, same as the first. Nutty, iced mocha coffee. A hint of dark, burnt chocolate. The aftertaste is burnt coffee and hazelnut. In fact, the aftertaste exceeds and eclipses the regular flavor. Combine this with a slick, motor oil feel and you have yourself a lovely, smooth-drinkin’ delight. It’s a little out of season in the dog days of summer, but I’ll take it. If you have to age one, age this one. So there you have it. If you missed out on the Beer Camp Across America, you can pretty much rest assured that I’ve just essentially replicated the exact experience for you. Plus you can read this and safely drive immediately afterward; you’re welcome. Be my virtual drinking buddy on Untappd, or send me a message via RateBeer. Or just leave a comment. ~ by William H on August 25, 2014.